The transcriptional coactivator with PDZ-binding motif (TAZ) functions as a downstream regulatory target in the Hippo signaling pathway that plays various roles. We previously developed a cell-based assay and identified the TAZ activator IBS008738 as a potential therapeutic target for glucocorticoid-induced atrophy. To further explore the application of IBS008738 in various muscle-related diseases, we examined the function of IBS008738 in inflammatory cytokine-mediated mouse muscle responses after traumatic brain injury (TBI). Preliminary screening suggested that IBS008738 treatments increased the levels of IL-10 in C2C12 cells. In TBI and sham control mice, we compared the effect of IBS008738 treatments on TNF α, IL-6, and IL-10 mRNA levels, muscle morphologic changes, and macrophage phenotype changes. 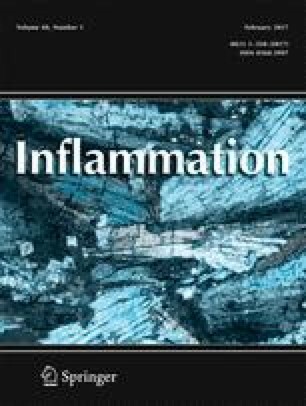 Our findings support that the TAZ activator IBS008738 decreases muscle wasting by upregulating IL-10 and inhibiting TNF α and IL-6, and this process is implemented by changing the macrophage phenotypes. These results indicate a new mechanism of the TAZ activator as a potential therapy for atrophy. The online version of this article (doi: 10.1007/s10753-016-0457-5) contains supplementary material, which is available to authorized users. We are grateful for Hata Yutaka (Tokyo Medical and Dental University) for materials and advice. This study was supported by Grant from the National Natural Science Foundation of China (No. 81401143). All experiments were done according to the international and institutional guidelines for animal care, and all experimental procedures were approved by the Animal Care and Use Committee of China Medical University (protocol number 2014PS28K).